Mitchell scored only a solitary run but deserved to be called back. The Decision Review System (DRS) was introduced to overturn the on-field howlers from the umpires. 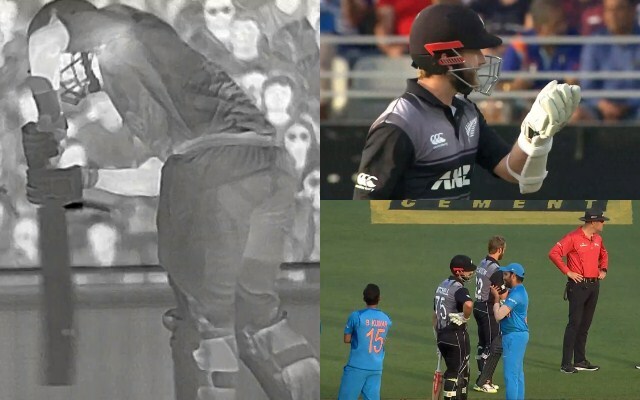 But at the Eden Park in Auckland where the second T20I between New Zealand and India is being played, the third umpire Shaun Haig used all the technology to rule Daryl Mitchell out wrongly. There was chaos in the middle but the batsman had to walk back with the umpire’s decision being final in the end. The incident took place in the sixth over of the innings. Krunal Pandya bowled a short delivery which skidded through the surface to hit Daryl Mitchell’s pads and the umpire gave him out straight away. But the batsman had inside-edged the ball and went for the review right away. The replays clearly suggested that the ball hit the ball on its way before going to rap on the front pad. Moreover, the hotspot also confirmed the same with the TV umpire asking for the Real-Time Snickometer (RTS). However, to everyone’s surprise, there was a flat line in RTS which led to the third umpire upholding the on-field decision to rule the batsman out. Meanwhile, the decision led to the dramatic scenes in the middle as Kane Williamson clearly protested it. Everyone was shocked as Team India also saw it on the big screen that there was the inside edge. Both the batsmen confronted the umpire to reconsider the decision again even as Rohit Sharma stepped into the discussion. Mitchell seemed to be asking Rohit to withdraw the appeal and at one stage, it looked like the Indian captain was convinced. He also spoke to the umpires regarding the same it seemed. But in the end, the batsman had to walk back to the hut as the final decision was made. Rohit, as it looked, wasn’t allowed to call back Daryl Mitchell and the details on the incident could be revealed at the end of the match itself now.